Hello all, just wanted to post an update. I have been stamping with the 1.5 mm and 2mm single needle for 6 months. I have been also combing that with the Suctioning method for the past 3 months. My expectations have been realistic and I am glad to report at least 25% improvement. I know its not much but it is something! I noticed my scars are not as sharp amd jagged at the edges and they are smoother. Not completely filled in but little by little appears to be. I have been taking the vitamin c orally for the past 4 months and use Retin A 0.025 every night. My friends and family say they see improvement! Even my dermatologist is curious with the turnout. All the best to those doing the derma needling and hang in there! Wow Mila. That is way more than a 25% improvement. It looks more like 70% to me. Those are fantastic results. Keep it up and they'll soon be hardly noticeable at all. 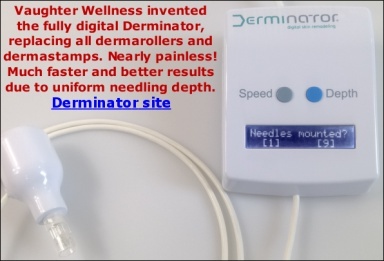 Mila - I have the same type of acne scarring and just purchased the derma needling products - 1.5mm roller and stamp - I can only hope to get your results - good job and you should be proud! Yes, Mila your skin looks great! My areas of concern look just like yours and also on my cheeks. I am motivated by reading about your routine and seeing the results. Thank you for sharing and taking photographs. Hello everyone, and thanks for your best wishes! I do this after I've had my shower before I go to bed only... So just that one time, not several times during the day. I splash some warm water on the parts I am about to suction, ( I find it easier on the skin to do this) I use the suction pump and hold it for about 6 seconds over the spots I needled and literally drag that cup over the entire needled area, pumping along to maintain the pressure. I even pass it a few more times just to be thorough. I know I have done as the study if my skin is slightly elevated as a result of the suctioning. Afterwards, I apply the tretenoin gel. Just a heads up though- This causes bruising that is very noticable, (but it always goes away) That's just what I've been doing! She got them from us I think, when we still sold our previous model. We have done a lot of research and there exist no single needle that can safely be used. We used to have a big forum posting about why, called "the single needle design sage". No tattoo needle, no acupuncture needle, no hypodermic needle, they're all unsuitable. That's why we're still working hard to get them for sale this year..
Mila uses both dermastamp and single needle and the dermastamp is also an excellent choice, esp. when you have large areas. Also, to begin with for the first months, the dermastamp is a good choice, on areas as large or larger than the diameter of the dermastamp (or even a little smaller, since you should needle a bit around the perimeter of scars as well). The only halfway acceptable needle (that will still cause heavy bruising and subcutaneous bleeding due to the lack of a stop) is a cactus needle. It has usually the required very long taper and small diameter. We have a first batch of 180 x 5 needles available for sale in our store now. NOTE: Some needles (the occasional needle) are slightly longer than 2 mm. We're working on getting the needles all 1.8 mm +/- 10%.